Although you need some history of the Mobile Suit Gundam series to appreciate, most lovers of anime should easily be able to pick this series up and enjoy the story for what it's worth. With that said, Mobile Suit Gundam 0083: Stardust Memory occurs after the previous series and revolves around a young Gundam pilot called Kou Uraki who has been given the arduous task of recovering a stolen Gundam from the Zeon pilots which was stolen from the Earth Federation. Unbeknown to them, the Zeon pilots have other plans for this powerful Gundam. Of course the main theme of Operation Stardust is quite a curve ball to the series that is quite intricate in its own way and without spoiling the motivations of the Earth Federation or the Zeon pilots, it is a common theme which goes through the entire series. 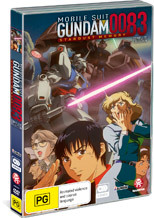 Although Kou is the main character in this series, a rookie Gundam pilot, the creators have toned him down a little as he plays the average man quite well. Add in a love twist with Nina Purpleton, one of the scientists behind the Gundams and it's interesting to watch these character evolve throughout the series. The two antagonists in the series include Gato with his desire to protect and Cima Garahau, an almost seductress like villain who is definitely the one to watch in the series. If your fan of the ideology behind Mechs than Mobile Suit Gundam 0083: Stardust Memory is right up your alley with some well choreographed battles that looks quite stunning and some interesting uses of this powerful robots. In terms of plots and character development, the characters in this series are generally explored well but it's lacking that true insightful connection which I found a little annoying. Featuring a healthy dose of action and drama with some political intrigue, Mobile Suit Gundam 0083: Stardust Memory is quite a decent looking animated series for its age with bright colours and crisp images. Match that with a great soundtrack, especially the theme of this series and when the battles heat up, it's easy to get lost in the sometimes over the top battles. In conclusion, although never seeing the original Gundam series, I did not feel left out too much and the series is quite enjoyable although clichéd at times for a Mech cartoon. The characters are interesting and some of the plot lines regarding the Earth Federation the Zeon pilots was quite fascinating to watch. Needless to say, great animation and some spectacular battles definitely makes this a fun anime experience!